This is a nice fan video for "Vienna," with English and Spanish lyrics by Victoria Gómez Peláez. There are other fan videos that often use images of sad or lonely teens, like this. 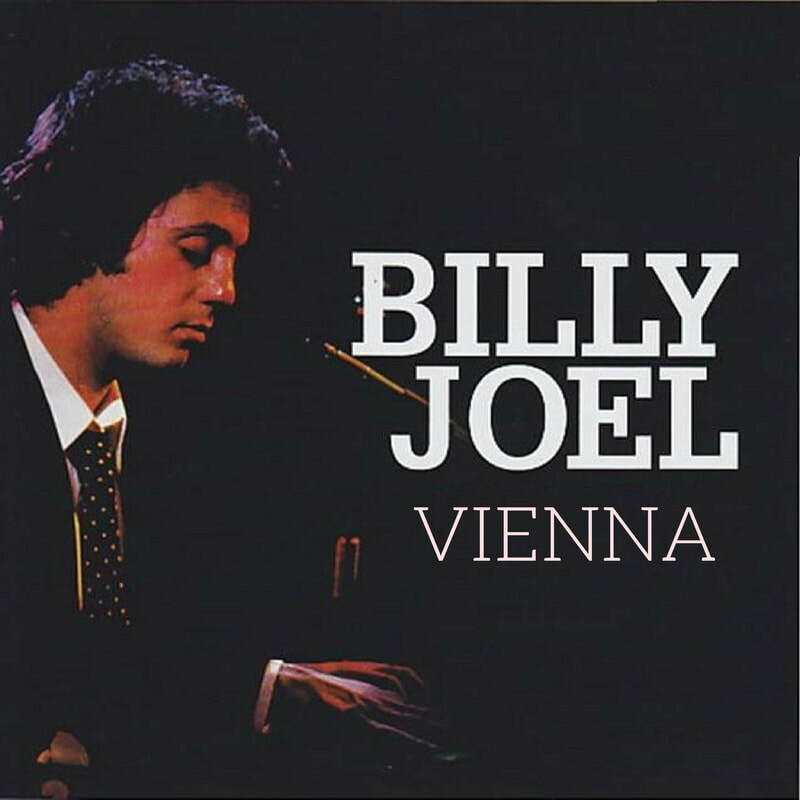 For Billy Joel fans, "Vienna" ranks as one of his finest songs. Although it was never released as a single, many fans and critics point to this song as the epitome of Billy's craftsmanship and talent. "Vienna" begins with a wistful Kurt Weil-like piano intro, evoking a melancholy European cabaret tune, and then moves into a nicely paced ballad. 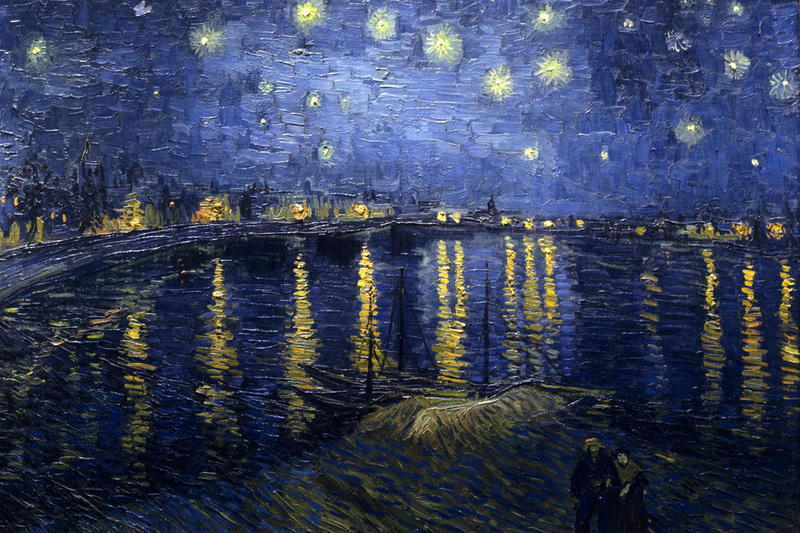 The accordion solo by Dominic Cortese in the bridge reinforces the European sensibility, and really gives the song its character, not unlike a starlit night on a European river such as in Van Gogh's Starry Night Over The Rhone (see below). In "Vienna," Billy urges us to "take the phone off the hook and disappear for a while" as "Vienna waits for you." It's something we should listen to, especially as our world becomes more technology-oriented and electronically-connected, and yet more emotionally-disconnected. Put your cell phone and tablet away, "it's alright you can afford to lose a day or two" since Vienna waits for you. 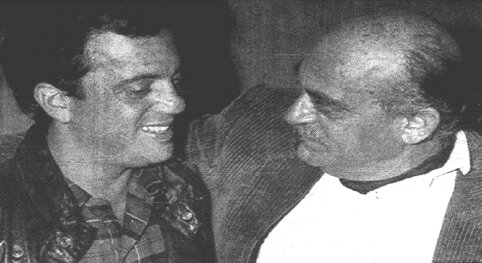 Billy and his father, Howard Joel. Source unknown. "Vienna" is a metaphor for old age, it is not something to dread, but something to embrace. You can still have a productive and peaceful old age. Billy said that the inspiration for the song came when he was visiting his estranged father, Helmut (Howard) Joel, in Vienna. He saw an elderly woman sweeping the streets, and told his father that it was awful to see an old woman doing that, but his father pointed out that she was doing something useful and productive (click on the video, below right, to hear Billy explain it). In America, we tend to push aside the elderly, but in many other countries the elderly are revered and respected, and contribute to society in many unrecognized ways. Billy has also said that "Vienna" may subconsciously be about his father. Billy's father had left the family when Billy was a child and returned to Europe, but remained a musical influence. Billy discusses the Kurt Weil-like intro to "Vienna" on SiriusXM. Billy discusses the music of "Vienna" on SiriusXM. Starry Night over The Rhone by Vincent Van Gogh. Billy's producer Phil Ramone has said that the one Billy Joel song that aspiring songwriters most often ask him about is "Vienna." It's no wonder. The song touches and moves you like few songs can, both musically and lyrically. This summary of "Vienna" does not the song justice. I am still looking for the definitive written article, analysis, or appreciation of "Vienna." I have not found one yet. If you find one, please let me know by sending an e-mail to onefinalserenade@gmail.com. "Vienna" has been covered by many amateur and some professional singers, but the only version I like is this understated cover by Eugenie Thompson (or go to Videos page and scroll down). She uses some unique phrasing and gives the song a new perspective. It is better than the somewhat bombastic version by Arianna Grande which lacks nuance and subtlety. After 1978, Billy rarely played the song live in concert, until resurrecting it in the 2000's. The song was used in an episode of the popular 1970s television series Taxi (YouTube fan video) in a seminal episode of the series. You can read a good article about the Taxi episode by Noel Murray on AV Club, here. "Vienna" was also the main song for the 2004 movie 13 Going On 30 (YouTube fan video), and seems to have become a favorite of emo teenage girls. Here is a good fan video, and you will see what I mean. And here is a short article on what "Vienna" meant to fashion industry CEO Sophia Amuroso after her divorce, from The Wall Street Journal (2016). Great live version from a 1977 concert at Nassau Coliseum (audio only). Billy explains why he chose Vienna as a metaphor for growing old and taking it easy, from a Q&A session which is on The Complete Hits boxed set from 1997. See more videos at Vienna - Videos Page.